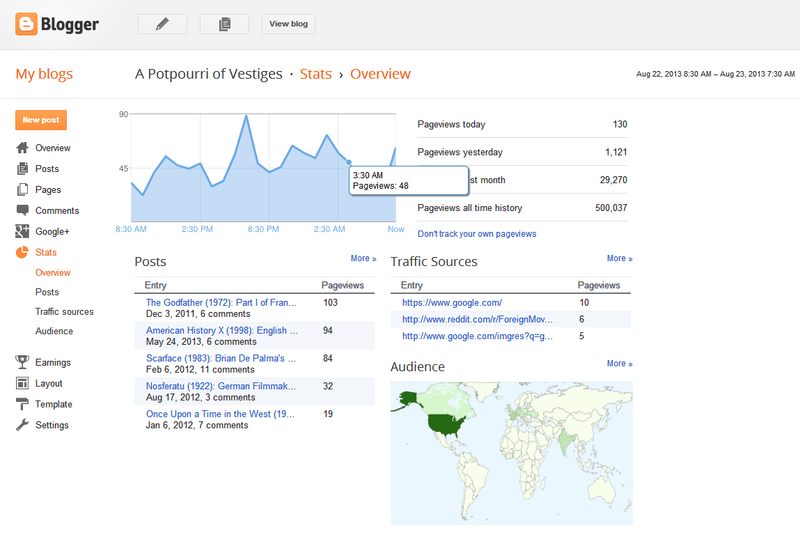 I am delighted to share with you all that today my film blogsite "A Potpourri of Vestiges" has completed half a million hits. It's been a long wait but one that has been worth the time. As always, I would like to start by thanking the God Almighty for giving me the courage to pursue my passion whole-heartedly and fearlessly, through thick and thin. I would like to extend my deepest gratitude to all my readers, friends, fellow movie-buffs, critics, bloggers, filmmakers, who have been instrumental in making the blog a grand success. Operating since October 2011, "A Potpourri of Vestiges" is dedicated to the cause of propagating the power of cinema to far corners of the globe. What had started out as a mere means of self-indulgence has today blossomed in something significantly promising. The prime focus of the blog is to highlight contemporary as well as classic cinema—foreign, independent, and cult—by analyzing movies through means of reviews, essays, critiques, etc. and by the coverage of major international award functions and film festivals. Today, the blog has a strong and ever growing readership base, a healthy mix of masses and aficionados, uniformly distributed all across the globe. We also have a strong social media presence, with a considerably large number of followers and subscribers on facebook, google plus, twitter, and other platforms. 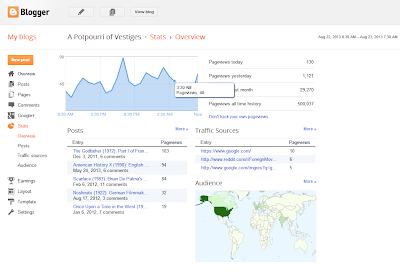 On an average, the blog receives a total of 30,000 pageviews/month. As I continue this amazing journey, I would like to offer my deepest gratitude to all those who have helped made it a reality: the fellow bloggers/cineastes at various blogging/social networking platforms, especially IndiBlogger, theLAMB, Pagalguy, WriteUpCafe, blogadda, Facebook, Google+, and Twitter. Previous Post: How effective are film sequels...? Congratulations on achieving such a splendid milestone! Congratulations! And may you reach many more milestones! Congrats Murtaza, on another big milestone reached!